The Peace Chapel is an environmental landscape site designed by architect Maya Lin. It occupies a 14-acre site within the 170-acre Baker-Henry Nature Preserve. Located near the Juniata College campus, the Peace Chapel provides a contemplative setting within the rolling hills of central Pennsylvania. Designed and constructed in 1988-1989, the Peace Chapel consists of two sites. 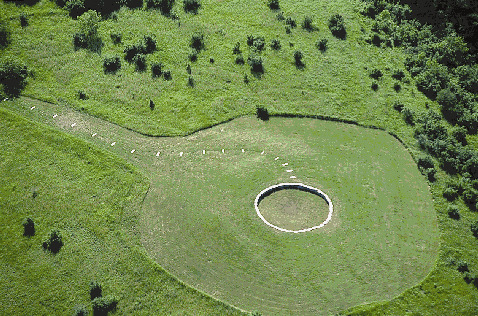 The larger site is defined by a 40-foot circle of rough granite stones that line a shallow well at the top of a hill. A series of smoothly polished granite steps lead from the footpath up to the circle of stones. The smaller site occupies the top of a slightly higher neighboring hill. This smaller site consists of a 4-foot diameter smooth granite disk set within the forest that blankets the hill. From the disk one can peer through the trees to the distant hill and view the larger circle of stones. The Peace Chapel was created through the generous support of Elizabeth Evans Baker and John Calhoun Baker (Juniata Class of 1917). The Vietnam Veterans Memorial, Washington, D.C. The Peace Chapel is open daily from dawn to dusk. Please contact the Juniata College Museum of Art (814-641-3505). As you approach Huntingdon, watch for signs to the hospital (a blue "H") and a right directional sign for Petersburg. These signs direct to Cold Springs Road. Turn Right onto Cold Springs Road. Follow Cold Springs Road for several miles. Turn Left onto Warm Springs Avenue (if you see the entrance sign to Westminster Woods, you have gone too far). Travel four blocks and Turn Left onto Peace Chapel Road. Parking is located 200 yards on the right. Continue on Moore Street through town and past Juniata College (between 17th and 19th streets). Once past the College turn right at the stop sign onto Cold Springs Road. Continue on Cold Springs Road After passing Westminster Woods, prepare to turn right. Turn Right onto Warm Springs Avenue. Continue on Cold Springs Road, after passing Westminster Woods, prepare to turn right.